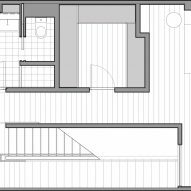 Brooklyn studio Light and Air Architecture has overhauled a local home using a new structural stairwell to link together the whole interior below a skylight. 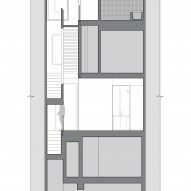 The studio reconfigured the 2,700­-square-­foot (251-square-metre) Switchback House around the stairwell, which is constructed between large white panels. 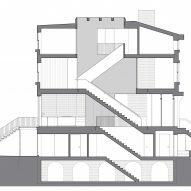 Steel beams were inserted at each of the three storeys to reinforce the existing joists, doubling the staircase's original opening and allowing better visual connections across the different levels. The design eliminates certain sections of the top floors, allowing light to pour down from a new 14-foot (four-metre) skylight overhead, and permeate through the whole interior. 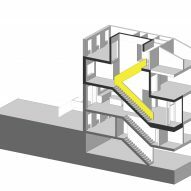 "The Switchback House opens up the traditional row house by replacing a stacked stair with a switchback stair, and inserting a dramatic skylight atop the new vertical stair volume," said Light and Air Architecture, also known as L/AND/A. 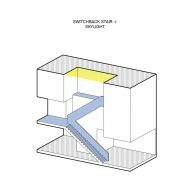 The switchback design also removes a hallway that typically links stacked stairs. The result is a new 32-foot-high (10-metre) space that visually links the three floors. Other interior walls were ripped out to form open-plan living spaces. Wooden spools and railings on the existing staircase were replaced with solid white guardrails to compliment with the otherwise minimal interiors. American white oak lines the floors, with other timber details throughout adding warmth. Upon entering the house, is the white staircase whose slatted step design is only revealed on the upper floors. 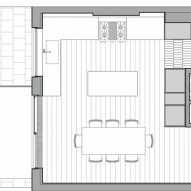 On the ground floor are a living room and a kitchen with dining area, which are separated by a storage area and powder room. A large black pendant light by Brendan Ravenhill sits above the dining table. Storage units are white, with lower kitchen cabinetry in timber to match the floor, tables, and chairs. White marble lines the countertops. 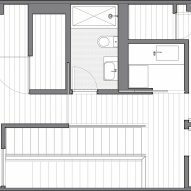 A large bedroom and a bathroom can be found on the first floor, while another level up are three rooms and another bathroom. 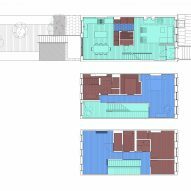 These stacked floor plans reveal the narrow footprint of the building, which has a private garden at the back. Located in the Brooklyn neighbourhood of Bedford Stuyvesant (Bed Stuy), the home was built as a traditional row house in the 1880s. 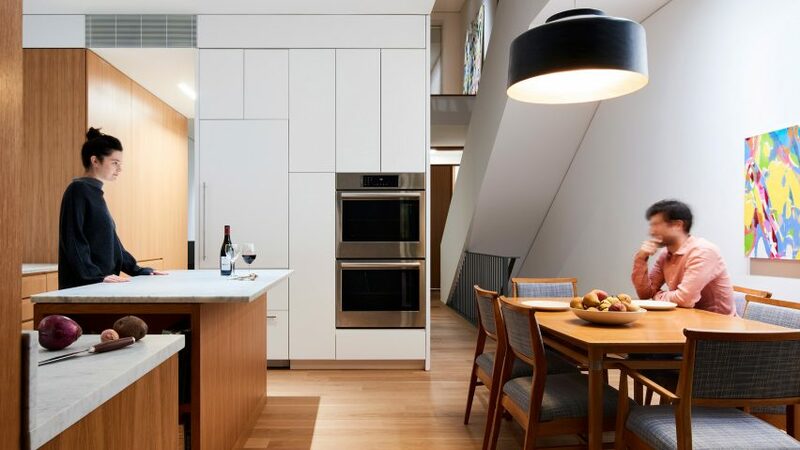 "Townhouses historically tend to be dark, narrow and divided spaces, with each floor visually disconnected," said a statement from Light and Air. The firm found to it in disrepair, with much of the historic detailing removed. "The original layout had been reworked over the years into a rooming house with multiple small apartments, eroding the original grandeur of the space," said Shane Neufeld, an architect at the firm. "This was an opportunity to try something new ­to rethink what a townhouse in the city could be," he added. Altering a staircase is a common part of property renovation in New York City, as seen at a Brooklyn townhouse overhauled by GRT Architects, a spacious Tribeca home revamped by Dash Marshall and a West Village penthouse apartment updated by TBD. However, for comparison, the original staircase was retained when White Arrow recently redid the interiors of a row house in Queens.